I hope you will be satisfied with what I have done. I am not romantic, you know; I never was. 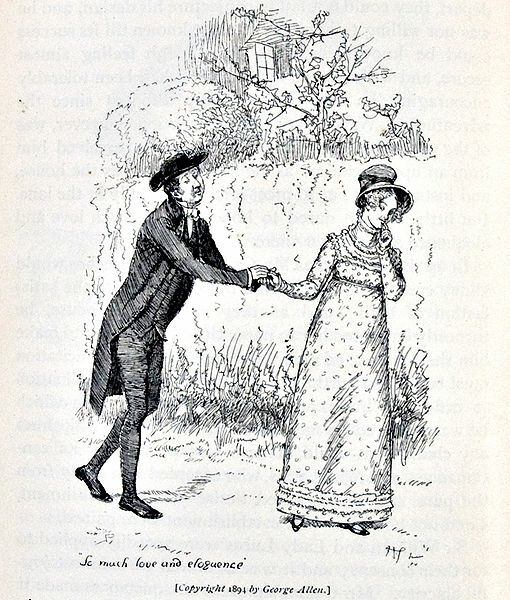 I ask only a comfortable home; and considering Mr. Collins’s character, connection, and situation in life, I am convinced that my chance of happiness with him is as fair as most people can boast on entering the marriage state. “Happiness with him,” she says. Does this sound like love, or even an expectation of it? Indeed, there seemed to be little of it when Lizzy later discovers her friend has ordered her household so that her sitting room is on the opposite end of the house from her husband’s. Where is the love? To modern eyes, it seems nonexistent. To the ancient Greeks, it is there–and so, too, for those in the Regency. Trusting to love after marriage was more common in those days than entering that estate with it. As proposed in Ruth Perry’s essay, Sleeping with Mr. Collins, the notion of love during the Regency was poised between two eras, the sensibility of the prior century and the growing desirability of romantic love in the next. She couches this theory within the context of marriage, that in the seventeenth and eighteenth centuries romantic love was not required for marriage and indeed, sexual desire was not in any way a component thereof. A sensible marriage had a better chance for producing love than the notion of proceeding with the vows while clouded by emotional desire. This had begun to fade in the nineteenth century. Thus, we have in Austen’s famous novel the two friends, one representing the old way and dear Lizzy the new. We don’t know if Charlotte eventually fell in love with Mr. Collins. It seems if Austen wanted to condemn her to eternal disgust she might have indicated that future for this character, but she did not, leaving us to speculate. Austen’s niece went on to relate that her aunt’s rejected suitor later found great happiness with a woman who was “quite fond” of him. Caroline practically sighs with regret even as she admires her aunt for choosing love over the security of marriage. Frankly, I agree with Ms. Perry that Jane Austen just couldn’t see herself being called Mrs. Bigg-Wither. This entry was posted in Regency, Uncategorized and tagged Caroline Austen, Charlotte Lucas Collins, Harris Bigg-Wither, Jane Austen, pragma, Reverend Collins by Angelyn. Bookmark the permalink. Your last comment made me think of Preston Jones’ Lu Ann Hampton Laverty Oberlander, who had disasterous marriages and didn’t marry her high school sweetheart ,bc she didn’t want a common last name! I guess one must consider last names , if one doesn’t want to be a Bigg-Wither. Names like that really put a damper on things. Thanks for stopping by! It’s difficult for we moderns to relate to that type of “love,” but you have really nailed it, Angelyn, in this post. Great job. Your compliment is very gratifying. I was hoping this little piece could shed some historical light on practical love. Fantastic job, Angelyn. I do think is still goes on, but the results are not the same. I can’t tell you how many people I’ve known, men and women, who convince themselves they’re in love because they want to be married. Many of them these days get divorced instead of staying in what our society calls “loveless marriage.” I have a friend who is best friends with her ex-husband, and she’d still looking for love, but all her other relationships are disasters. Oh, that is a sad story. Love is such a fickle thing. I’m glad you came by, Ella.